When I rented a 14 mm lens recently, I found myself trying to zoom the entire weekend. I am almost exclusively a zoom lens photographer. The convenience is hard to beat when I am walking around cities, shooting a building or doing some street photography or taking a picture of my lunch. The glass in my 18–135 kit lens is no match for the optics in my 70–200 L series, but the former is a great all-purpose lens. It’s also much smaller and therefore less noticeable. But I wanted to challenge myself, so I rented this 14 mm (not a fisheye). On my cropped sensor 60D, it’s effectively a 21 mm lens. The first thing I noticed when I opened the case from Pro Photo Rental in Boulder was the heft of the lens—it’s heavy for its size. The second thing I noticed was how far the glass curved out, almost as far as the built-in lens hood. The cover for this lens is a dome, and although it’s pretty secure, I wouldn’t take the lens out in a dust storm. My first stop was Colfax east of Colorado. 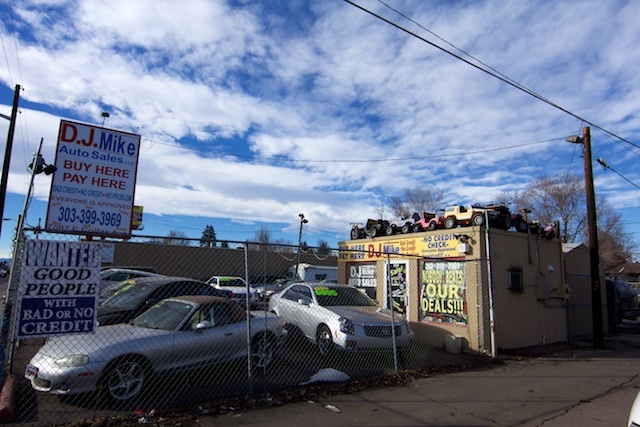 Other than an early encounter with a used-car dealer who didn’t speak very good English—I finally said, “I like taking pictures of Colfax,” and he gave up—people let me alone. I really wanted to take pictures of the girl at the Niagara House Motel zooming around on her scooter, but I’m not comfortable taking pictures of children without permission. Sometimes my heart was in my mouth as she got down low on her scooter and zipped across the side street; I’m not sure a driver would have seen her. But she was having fun. 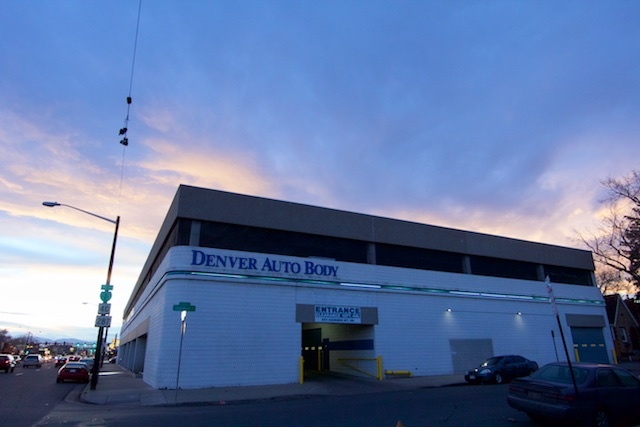 As the sun went down on Colfax, I realized this lens made it possible for me to get all of Denver Auto Body in the shot, along with the sunset. I thought, This is so cool! But then I worked with it in Aperture and realized I don’t have the skills to fix the exposure, which looks like a compromise between exposing for the sunset and exposing for the building. When I bring up shadows, for instance, the picture just looks gray. 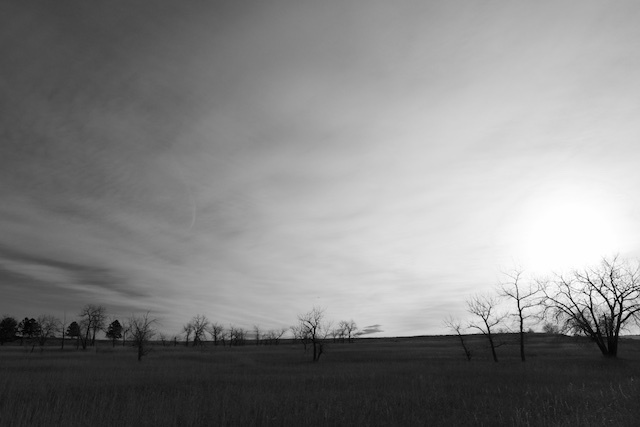 The next morning, at Cherry Creek State Park, the light and the landscape worked together. 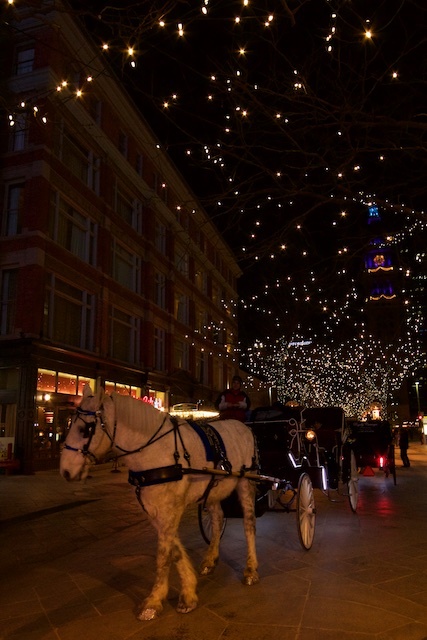 That night, along the Sixteenth Street Mall, I was able to get the airy shot below. I could have captured the horse and the clock tower with other lenses, but I wouldn’t have been able to include the lights overhead. Unfortunately, the shot is blurry and grainy (the horse was moving, and I was shooting without a tripod), so I’m not sure what I can do with it. 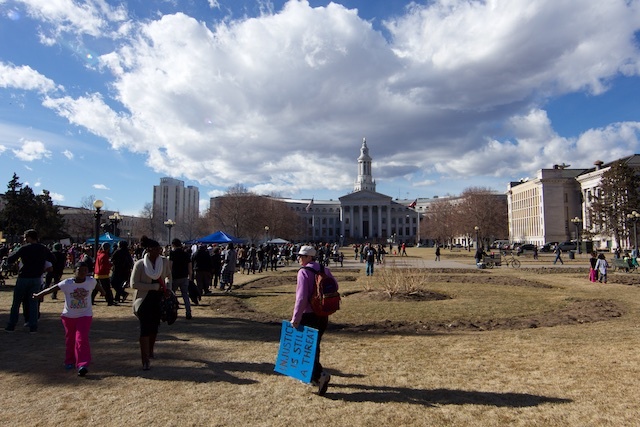 The far-right shot would have been better with a telephoto, of course, but I was amused by it. Here is where the 14 mm really shines.